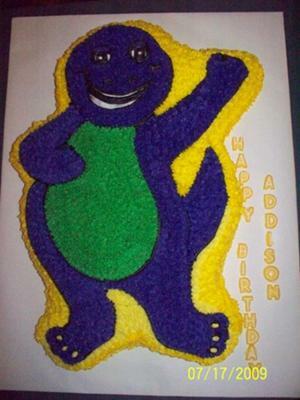 To make this Barney cake, I used one cake mix prepared according to directions, and a Barney shaped cake pan I found on Ebay. I used buttercream in white, black, purple, yellow and green. I used star and round tips. This is the 2nd Barney for the same little girl. They seem to get better the more you do them. Join in and write your own page! It's easy to do. How? Simply click here to return to Barney Cake.